One of the pleasures of studying old arms and armour is the opportunity to combine different types of evidence. Texts, images, archaeological remains, reconstruction, experiment, and comparison with other cultures can all help to understand how these objects were made and used. Of these, texts tend to be the most neglected. Scraps of evidence are usually scattered across collections of documents and libraries of literature, and many of these texts are difficult to obtain. Digitalisation projects often concentrate on literature, or trim out technical details to save space. And since armour scholars are often amateurs, they sometimes feel uncomfortable finding and using texts in old languages. I cannot remove these difficulties and discomforts, but I would like to do something to make them less. This page is a directory of texts describing armour from around the world. In keeping with my own interests, it focuses on textiles, the construction of armour, and the wearing of armour. I am not familiar enough with the sources to contribute much outside of the ancient Near East, the classical Mediterranean, and later medieval Europe, so I welcome suggestions from other lands and cultures. I intend to focus on texts in their original language, providing a parallel translation where one is available or I can write one. Because life is short and this is a work of world history, I may sometimes resort to posting a translation alone, but only in extremis. Studying old armour is as good an excuse to learn old languages as any other, and understanding many texts requires an understanding of the original terms and their meaning at a particular place and time. Sources on this page are organized roughly chronologically and marked with the part of the world which they describe. To save space and typing, centuries are abbreviated as Roman numerals with a – for BCE and a + for CE. For example, -VI is the sixth century BCE (circa 600-501 BCE). ancient (origins of writing to 6th century BCE), classical (5th century BCE to 5th century CE), early medieval (6th century CE to 10th century CE), late medieval (11th through 15th centuries CE), and modern (16th century CE to present day). I will record changes to this page after March 2017 under What’s New. 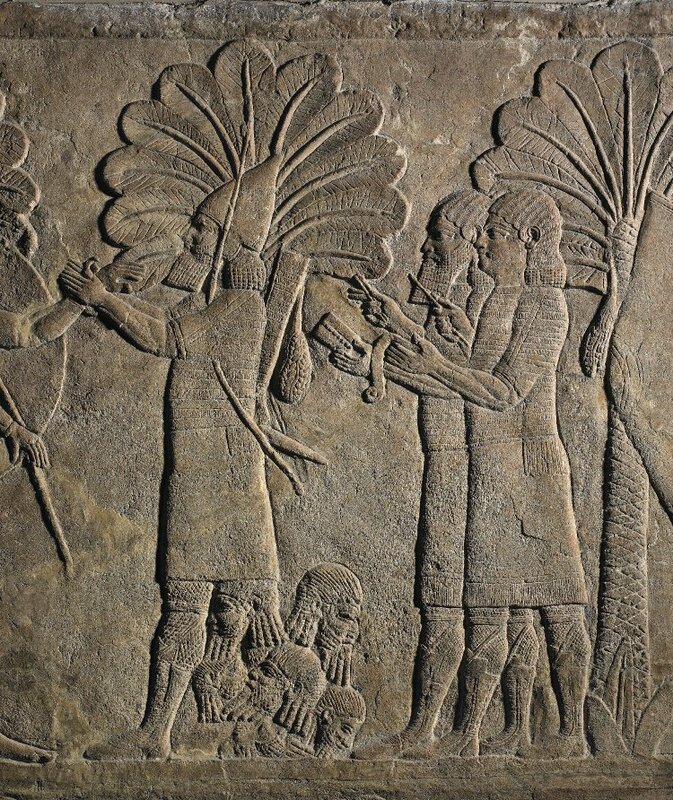 Scribes take notes as an officer rewards a soldier for taking enemy heads on an Assyrian relief from Nineveh, late 7th century BCE. British Museum, Number 124955. Image courtesy of the British Museum here. Lists of Materials from the Akkadian Empire (Southern Mesopotamia, before 2000 BCE): Cuneiform texts from the age of Sargon and Naram-Sin list the amount and types of copper, silver, skins, and wool required to make different kinds of helmets. See the entry “Helm A. Philologisch” in the Reallexikon der Assyriologie. One of these is from Susa, RT 35, 28 = MDP 14 Nr. 86 and mentions bronze caps (SAG̃ŠU.ZABAR) each of which contained 1 2/3 minas of bronze (ZABAR) and caps of oxhide (SAG̃ŠU.KUŠ.GUD) made of oxhide, goatskin (KUŠ.MAŠ2), and 1/3 mina of wool (SIKI). Various, Amarna Letters (Egypt, Levant, Syria, -XIIII): This cuneiform archive from Egypt includes descriptions of gifts including arms and armour. I don’t have time to create a page for these yet, but see a transcription of the cuneiform here and the printed translation into English by William L. Moran here. Nuzi Texts (Iraq, Late Bronze Age): Tablets from the city of Nuzi north of the Tigris describe the materials used to make scale armour and helmets for men and horses in great detail. They can be compared to the surviving armour in Tutankhamun’s tomb, paintings from other Egyptian tombs, and loose scales from various sites. They are translated in a PhD thesis by Timothy Kendall which is not yet available online, Warfare and Military Matters in the Nuzi Tablets (PhD Thesis, Ann Arbour, 1974) and summarized in another by Thomas Hulit which also describes the intact scale armour found in the tomb of Tutankhamun. Chou Li (State Handbook of the Chou Dynasty: China, early 1st millennium BCE): This handbook describes the leather armour which courtiers were to wear. See Berthold Laufer, Chinese Clay Figurines (Chicago: Field Museum of Natural History, 1914), pp. 175 ff (link) or Robinson’s Oriental Armour (reprinted by Dover Publications). Tel Halaf No. 48, Military Equipment for Ten Men (Iraq, -VIII): A tablet in the archive of an Assyrian governor describes equipment for ten soldiers, six equids, and a chariot. Link. Homer, Iliad (Aegean, -VII): Until I have time to collect and read and translate the right passages, here is a good book which discusses the main passages (link to publisher’s website). Salamis Decree, IG I3 1 (Athens, -VI): A few years before 500 BCE, the demos of Athens decreed a law governing their military colonists (klerochoi) on Salamis. It contains the first example that I know of where equipment or horses are described in terms of their minimum value. Similar practices continued as long as soldiers were responsible for providing their own horses, weapons, and armour; some of the French and Burgundian military ordinances from the 15th century CE describe horses in this way, for example. Skidmore College Classics Department has a transcription and translation; you can also find a translation in Meiggs & Lewis’s book on Greek historical inscriptions and a Greek text in the Packard Humanities Index under the region Attica as number IG I3 1 (link). Herodotus 7.61-100 (Southwest Asia, -V): A description of the ethnic arms of nations from Greece to India. Link (Greek text is available in an expanding sidebar). Gadal-Iama letter (Babylonia, -V): A contact between two tenants specifying the equipment, horse, and cash which one must provide when the other goes to a muster in Uruk. Link. Xen. Hippik. §12 (Greece, -IV): A lifelong horseman and soldier has a good rant about the best kind of equipment for a horseman. Link (I have not read the original recently, so I can’t vouch for the translation). Aeneas Tacticus, Poliorketika §10, 29, 30 (Greece, -IV): A thoughtful observer and reader suggests how a small city can best defend itself from enemies within and without. One of the issues is how to ensure that the right people, but only the right people, have access to arms. Link (I have not looked at the original either). Inventories from Attica (Greece, -IV): The Athenians also got into the habit of recording all kinds of ephemera on stone, including property of the city and the gods. An inventory from the end of the 4th century BCE, IG II² 1485 lines 60-63, mentions 13? cuirasses linen and scaly which were neither in good shape nor intact (θώρ[α]κ[ες λιν]οῖ καὶ [φολιδωτ]οὶ ∶ΔΙ[ΙΙ∶] ο[ὐ]χ ὑγιε[ῖς οὐδὲ ἐ]ντελεῖ[ς∶]) These may be descended from the 16 cuirasses listed in the year 369/8 BCE (IG II² 1424a). Amphipolis Military Decree (Macedonia, -II): Sometime in the second century BCE, the regulations for soldiers in the service of one of the Antigonid kings were carved on marble. Among other things it listed penalties for appearing without a specific items of equipment. There is a published translation in M. Austin, The Hellenistic World from Alexander to the Roman Conquest no. 90 pp. 180ff (Google books link); for transcription of the Greek see SEG 40.524 on the Packard Humanities Institute website or M.B. Hatzopoulos, Macedonian Institutions Under the Kings, Volume 2. Epigraphic Appendix. Athens 1996 (I have not seen this). Polybius 6.19-25 (Italy, -II): Polybius’ famous description of how the Romans raised their armies includes a detailed description of their equipment. The Loeb translation is available on Lacus Curtius but remember that it gives Latin equivalents for his Greek words and was written as a ‘crib’ for readers with the Greek text on the facing page. The description of the Macedonian phalanx is at Polybius 18.28-31 but unfortunately he assumes that Greek soldiers know how a Macedonian phalanx is equipped. Plutarch, Life of Alexander 32.8-12 (+II): Description of how Alexander the Great dressed for the battle of Gaugamela. Link (I can’t vouch for the translation). Hellenistic tacticians (Mediterranean, -I to +II): Theories of how to build the ideal army included the weapons and army which that army should use. Caesar, Civil War on the improvised armour at Dyrrachium (Mediterranean, -I) … This is one of very few pieces of evidence for soldiers wearing improvised armour before the 20th century (perhaps because in earlier times, materials were expensive, and soldiers did not have trains or motor vehicles to help them carry the weight). Diodorus and Nepos on Iphicrates’ reforms (Mediterranean, -I): Two sources describe how the Athenian general Iphicrates changed the equipment of his infantry in the fourth century BCE. The sources are Diodorus 15.44 (English on Lacus Curtius) and Nepos, Iphicrates 1 (Latin on Bibliotheca Augustana). Roman papyri and writing boards (+I to +III): P. Berlin inv. 6765 in Bruckner and Marichal, Chartae Latinae Antiquiores X I no. 409, P. Vindob. L135 (in Harrauer and Seider, “Ein neuer lateinischen Schuldschein,” Zeitschrift für Papyr. und Epigr. 1981), Tomlin, “Roman Manuscripts from Carlisle: The Ink-Written Tablets,” no. 16 Text Relating to Missing Lances, Vindolanda, Vindonissa, P. Aberdeen 70, letters of Claudius Terentianus the marine in P. Michigan VIII.467 and VIII.468 (P. Mich. inv. 5391 and P. Mich. inv. 5390), P. Giss. 47 where an agent buys a cuirass of good brass (θῶραξ ἐκ καλοῦ ὠραχάλκου) for a strategos in Egypt for 360 drachmas of silver sometime around the reign of Hadrian (available in Greek and German) … Available on Armour in Texts. Anonymous treatise on military matters (de rebus bellicis) (Western Roman Empire, +IV or +V) … here there be dragons! (To start your research into western sources, see the Reallexikon der Assyriologie and Bishop and Coulston’s Roman Military Equipment; typing words for arms and armour into databases of inscriptions or modern dictionaries of classical Greek can also be helpful. Greek and Akkadian are probably the most useful languages to learn. I can’t give advice on Sanskrit or Chinese sources unfortunately). This website is reader-supported. If you found it helpful, please consider a small donation. Maurice, Strategikon (Eastern Roman Empire, +VI): A manual proscribing how cavalry and infantry should be equipped, with ethnographic notes on how the Romans’ main enemies fought. There are two main translations: one available in cheap paperback by George T. Dennis (link) and another scholarly edition by Philip Rance (link). I own the former but not the later. Books I, XI, and XII contain most of the information on arms and armour. The anonymous Byzantine treatise on strategy (Eastern Roman Empire, +VI): This text is said to recommend that soldiers wear a special thick garment under their armour. I have not seen it, but George.T. Dennis has a translation from Harvard University Press (ISBN 9780884023395). Monk of St. Gall, De Carolo Magno (Switzerland, +VIIII): In a series of anecdotes about Charlemagne and his world, the monk describes how the Old Franks, Charlemagne, and his army were armed. See book 1 chapter 34 and book 2 chapter 17 (pages 132-133 and 162-164 in Lewis Thorpe’s Penguin Classics translation). For the Latin text, see Monumenta Germaniae Historica, Scriptores, Vol. II (Scriptores rerum Sangallensium. Annales, chronica et historiae aevi Carolini) pp. 726-763 or Philipp Jaffé ed., Bibliotheca Rerum Germanicarum, Vol. IV pp. 628ff here. These sources are free to read, but finding and copying them takes time and money. If you found this website helpful, please consider a small donation. Some of the early sources for soft armour worn over or under mail in the late 12th century … check dictionaries of Old French, Old German, etc.? Nicetas Choniates or Akominatos (died 1217) described the linen body armour worn by Conrad of Montferrat, the man who would be king of Jerusalem, in 1187 or 1188. I hope to add this text in the future. Anonymous, Moriz von Craon (German-speaking region, +XIII): Another Arthurian romance with arming scenes. dô zôch er aller êrste an / ein wambes von buggeran. / dô hieʒ er im reichen / einen vilz weichen / und bant in für sîniu knie. An edition of Moriz by M. Haupt is on the Internet archive, the brothers Grimm preferred one by Eduard Schröder. Various, Rules of the Paris Guilds (France, +XIII): Regulations for various guilds including the armourers who proscribed how gambesons, coats, gauntlets of whalebone, gauntlets of plates, etc. were to be made. Rules of the Paris Guilds. London Regulations on The Armour Trade, 1322 (England, +XIIII): A decision from 1322 addressing soft armour and covered headpieces was first printed in appendix A of Charles ffoulkes’ The Armourer and His Craft before the First World War (Internet Archive edition) although a modernized version is available in British History Online. A transcription is available here. A decision from 1328 addressing the use of sheepskin to cover body armour and gauntlets was printed in Modern English in 1926 and is also available through British History Online. Various, Great Wardrobe Accounts of Edward III (England, +XIIII): Lists of materials used to construct garments for Edward III and his court survive in archives and give a very precise understanding of the amounts and types of cloth, cotton, and thread required for specific items. Among other things, they show that cloth and cloth-covered armours were part of the world of luxury textiles, alongside banners, tents, dragons’ heads, and other delights. A transcription of accounts from the 1340s, complete with the original abbreviations, was published in Sir Nicholas Harris Nicholas, “Observations on the Institution of the Most Noble Order of the Garter,” Archaeologia: or, Miscellaneous tracts Relating to Antiquity xxi (1846) pp. 1-163 (available on the Hathi Trust); Latinists who don’t often work with medieval abbreviated texts will want a copy of Cappelli’s Dizionario di Abbreviature nearby. (Or use the online edition of the introductory essay and the individual entries). Various, Archive of Francesco di Marco Datini (France and Italy, +XIV): Descriptions of arms and armour owned, bought, and sold by a merchant from Prato. Datini’s archive is very large and very detailed, and few of the documents relating to armour have been transcribed and published, but a French summary of some of the Italian documents by Robert Brun was published in 1951. Link. Republic of Florence, Book of the Hirelings (Italy, +XIV): A volume in the archives of Florence contains a Latin contract which their mercenaries signed in 1369. 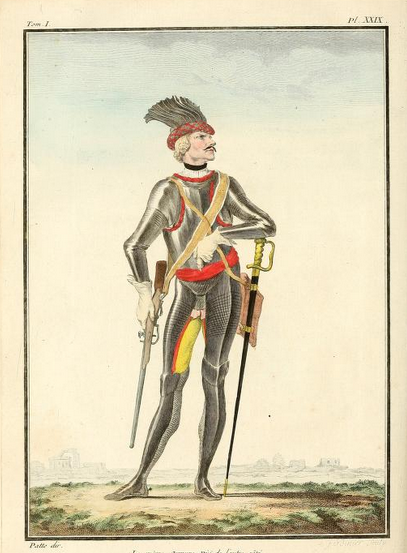 This contains many details of the minimum equipment of infantry and cavalry, with special clauses for English and Hungarian soldiers and those who wished to be equipped in the English fashion. Mercenaries and their Masters by Michael Mallett informs me that later contracts rely more on general phrases like “conduct themselves according to military discipline” and “well armed” and less on explicit details. The Latin text is available on my website. John Lydgate, Troy Book (England, +XV): Retelling of the Trojan War with the heroes dressed in the latest kit. Link. Johan Hill, Treatise of the Points of Worship in Arms (England, +XV): Instructions on how a champion can best be armed for a duel on foot. Transcription on Will’s Commonplace Book and discussion by several people who make and wear armour. According to an article by Thom Richardson, its shelf number is Ashmolean S 856 art. 22, 376–83 and the editio princeps was W.H. Black, Illustrations of ancient state and chivalry from manuscripts preserved in the Ashmolean Museum (London, 1840) pp. 1–11 (available on Google Books); Charles ffoulkes printed a copy of that edition, and the web editions copy ffoulkes. Anonymous, “How a Man Shall be Armed” (England, +XV): Instructions on how to arm a man for formal combat on foot with a famous illustration. Transcription of original English and translation into 20th century English. The famous “Hastings manuscript” now seems to be in New York, Morgan MS. M.775 http://corsair.themorgan.org/cgi-bin/Pwebrecon.cgi?BBID=158842. René d’Anjou, Tournament Book (France, +XV): Around 1460, this noble with scattered estates wrote a book on how to hold a melee on horseback like in the good old days, with detailed comments on the equipment which he did and did not approve of https://www.princeton.edu/~ezb/rene/renehome.html Steve Muhlberger is working on a translation of a related work by “Sicily Herald” which is much less well known. Martin Rondelle, “Letter to John Paston II” (Flanders, +XV) On 28 August 1473, an armourer in Brusells wrote to a wealthy client in England asking for clarification before he started a new project. The letter is summarized in English in various places, but you can find the original French on Project Gutenberg. French and Burgundian Military Ordinances (France, +XV): A series of 15th century military ordinances by Louis XI of France and the Dukes of Burgundy (in one case in the name of St. Maximin de Treves) describe the armour to be worn by various types of soldiers. These came to the attention of the arms and armour community when Charles ffoulkes translated and printed some of them a century ago. His English translations have since been copied by various people including James Barker. Sources for the orginals are difficult to find, but an article by David S. Bachrach cites Mémoires pour servir à l’histoire de France et de Bourgogne, 22 vols. (Paris, 1729), 2:285-94 (ordinance of 1471) and Lois Militaires de Charles de Bourgogne de l’An 1473, in Der Schweizerischegeschichtsforscher, 2 vols. (1817). Another describing jacks and pourpoints for Francs-archers was published in du Cange and I have copied and translated it. What appears to be a transcription of these articles is available from Legio Burgundiae http://legioburgundiae.unblog.fr/ but they do not cite their source. Various, Statutes and Privileges of the Armourers and Scabbardmakers of the City of Angers (France, +XV): Link. Sir John Howard, later Duke of Norfolk (England, +XV): The private account books of Sir John Howard from the 1460s and 1470s survive. These famously contain a few references to armour mixed among the other entries, including a list of materials for a doublet of fence and the names of various armourers and armour merchants. There is a collection of modernized excerpts in Robert W. Reed, Jr., “Armour Purchases and Lists from the Howard Household Books,” The Journal of the Mail Research Society 1.1 (July 2003) pp. 25-38 http://www.erikds.com/pdf/tmrs-journal-1.pdf but I don’t always agree with his modernizations of the original English. (A directory of sources, but focused on prices from England, is Randall Storey, Technology and Military Policy in Medieval England, c. 1250-1350 (PhD Thesis, University of Reading, 2003) which is sometimes online and sometimes offline. It used to be available here and has been archived by the Wayback Machine). (French works by 19th century archivists like Victor Gay’s Glossaire Archéologique du Moyen Age et du Renaissance [available on the Internet Archive and in old university libraries] and Dehaisne’s Documents et Extraits Divers [also available on the Internet Archive]) contain many more passages in French and Latin). (William R. Short from Hurstwic has collected all the references to weapons, armour, and combat in the Sagas of the Icelanders, written down between the 13th and the 15th century but set in older times, on the Hurstwic website). (And of course the dictionary of German by Jacob and Wilhelm Grimm has citations for many military words like Wams, Panzer, Plattenrock, Eisenhut, … the citations take some work to decode. Many libraries have a paper copy of this book). This website is free, but it is not costless. If you found it helpful, please consider a small donation. Pietro Monte (Italy, +XVI): At the beginning of the sixteenth century, this Spanish gentleman wrote down many observations about arms and armour … which were published in clumsy Latin translation printed in a Gothic font with many abbreviations and ligatures. So far, the font has repelled most of those who wished to learn from his experience. Matt Easton in the UK hosts a scan of one of Monte’s published works, the Collectanea (link to page 1); Sydney Anglo summarizes some of Monte’s suggestions in The Martial Arts of Renaissance Europe and “The Man who Taught Leonardo Darts” (The Antiquaries’ Journal, 1989). 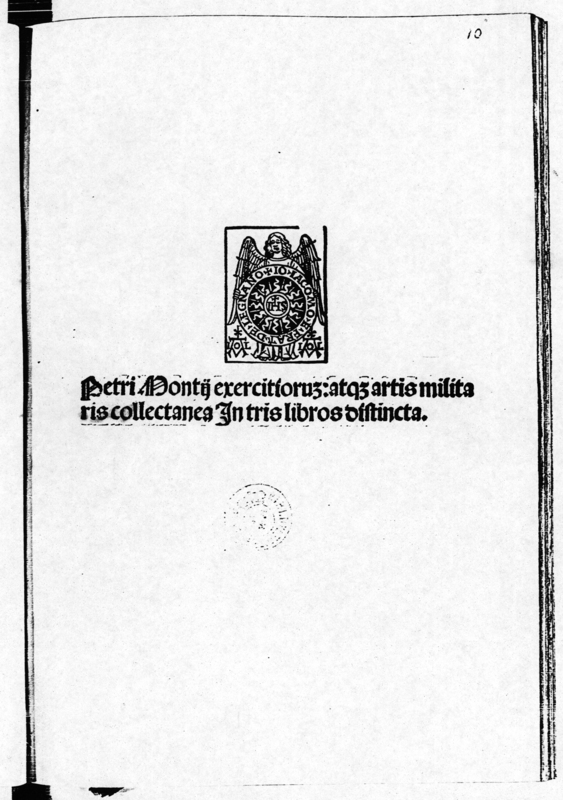 Jeffrey L. Forgeng stated that he was working on a translation during an interview with The Medieval Herald in October 2016, but scholars who propose to transcribe and translate Monte have a way of going silent … In 2018 he finally published Pietro Monte’s Collectanea with Boydell & Brewer. Mike Prendergast and Ingrid Sperber have released a draft translation without the Latin at http://mikeprendergast.ie/monte/. Bernal Dìaz, Diego de Landa, and other 16th century sources on Mesoamerican armour … are there any indigenous texts to cite? An English version of Díaz is available on Project Gutenberg and an English version of de Landa sections XIII and XIX on the Internet Sacred Texts Archive but I don’t know where to find the Spanish of either writer. William Harrison, Description of England book 2 chapter 16 OF ARMOUR AND MUNITION (England, 1577): Harrison gives a charming description of the role of arms and armour in Elizabethan England, when a minister might decide that the dignity of his position meant that he should only wear a hanger (short hunting sword) instead of a rapier when travelling. There is a transcription of a reprint from 1807 on the Perseus Project. Pedro de Aguado, Recopitación historial resolutoria de Sancta Marta y Nuebo Reyno de Granada de las Indias (oldest manuscript c. 1581): This Franciscan friar wrote a history of Venuzuela during and after his time preaching in the New World which includes a detailed description of the local armour stuffed with cotton (part I, libro secundo, capitulo secundo: pages 64, 65 of the edition in 1906 by the Imprenta Nacionale at Bogota, Columbia and pages 139-141 of the Historia de Santa Marta y Nuevo Reino de Granada published in Madrid in 1916. The friar was unable to overcome the Spanish censorship during his lifetime, and the 20th century editions both seem to ‘correct’ his dialect towards the spelling of their day. Sir John Smythe, Certain Discourses Concerning the Forms and Effects of Diverse Sorts of Weapons (link) (England, published 1590) and Certain Instructions, Observations, and Orders Military (England, published 1594) link): After the muster at Tilbury in 1588, an old English soldier (born ca. 1534, see the Dictionary of National Biography for a short biography, or the Victoria and Albert Museum for a sample of his taste in armour) published a series of pamphlets to help his countrymen understand that they were doing everything wrong and should go back to fighting the way they had when he was young and dashing. For some reason they refused to listen, but Smythe’s pamphlets contain many opinions about what different types of armour were good for and what they should be worn over, and some sharp comments on practices which he did not approve of. Maurice, Comte De Saxe, Mes Rêveries (France, +XVIII): In the middle of the 18th century, a French general laid down proposals for military reform in a spurt of manic energy. Among other things he called for the infantry to take up the pike and bucklers of leather stiffened with vinegar (book I, chapter ii) and the cavalry to wear a suit of armour as they had in his grandfather’s time (book I, chapter iii, Article 2 Of the armour of the cavalry or Des armures de la cavalerie); as he pointed out, soldiers had worn armour for hundreds of years after the introduction of gunpowder, and in battle many men were wounded with swords or stray balls which a light armour could stop. If you can read French at all, the original edition is worthwhile for the colour plates alone. Sakakibara Kōzan, Chūkokatchū Saisakuben aka. The Manufacture of Armour and Helmets in Sixteenth Century Japan (Japan, +XVIII): At the end of the eighteenth century, a Japanese courtier put together a passionate argument that his countrymen should use the styles of armour which had proved effective in the wars of the Sengoku period, and not be seduced by elaborate decorations or earlier styles of armour which sixteenth-century warriors had abandoned. In passing he gives a treasure-trove of advice about the advantages and disadvantages of different features, and the ways in which suppliers or armourers might try to save money. Unfortunately the early translations by A. Wakameda, A.J. Kroop, and Hogitarō Inada seem to have never been printed, and the only published one, by H. Russell Robinson, is in copyright but out of print. Lieutenant-Colonel Fitzclarence, later Earl of Munster, Journal of a route across India, through Egypt, to England, in the later end of the year 1817, and the beginning of 1818 (India, 1817/18): On his travels Fitzclarence spoke to some Indian cavalry and examined their thick coats. Link and transcription. Churchill on the Dervishes (Sudan, 1898) … for an example of the armour which he describes, see objects Af1899,1213.1 and Af1899,1213.2 in the British Museum or find the people who still make it for parades and mounted games! (Gabor Agoston, Guns for the Sultan (Cambridge University Press, 2008), and Alan Williams, The Knight and the Blast Furnace (Leiden: Brill), and Stuart W. Pyhrr and José-A. Godoy, with essays and a compilation of documents by Silvio Leydi, Heroic Armour of the Italian Renaissance (link to open access version) are three books which cite many documents on the production of arms and armour from the sixteenth and seventeenth centuries). (There is a great deal of information on soft and covered armours in early modern Europe in Ian Eaves, “On the remains of a jack of plate excavated from Beeston Castle in Cheshire,” Journal of the Arms & Armour Society, Vol. XIII, No. 2 (1989) pp. 81-154. The Tudor Tailor group in the UK plans to publish a book Doublets of Defence: Arming doublets, jacks and privy coats 1485 to 1603 which will consider texts as well as surviving pieces). 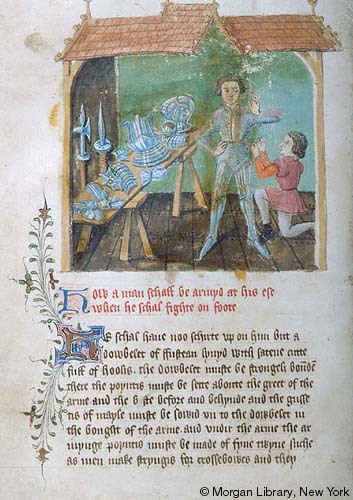 This project was inspired by observing online discussions about arms and armour, and by the linked projects Aquamanila, Armour in Art, Effigies and Brasses, and Manuscript Miniatures which try to bring evidence for late medieval material and military culture together in a taggable, linkable format. I acknowledge sources for particular texts on the appropriate pages. 2017-04-09: Added a link to the online version of the German dictionary by the Grimm brothers and to the Lexikon zur byzantinischen Gräzität, a Medieval Greek-German dictionary. 2017-04-16: Added a few paragraphs to the transcription of the rules of the Paris guilds from 1364. 2017-04-23: Added P. Giss. 47 where someone in Roman Egypt buys a body armour. 2017-04-28: Added the anonymous Byzantine on strategy and the de rebus bellicis. 2017-04-29: Added a link to the scans of the English Great Wardrobe accounts. 2018-01-10: Added a note to include sources on Mesoamerican armour. 2018-01-16: Added links to the kind of cotton armour which Churchill faced at Omdurman to the Modern section. 2018-06-10: Announced the new transcription and translation of Monte’s Collectanea in the Modern section. 2018-11-15: Added the Itinerarium Peregrinorum; I plan to add translations of a few passages. Added a note to search some sources from the Moslem world if I can find a good guide. 2018-11-29: Added a link to one of the texts from Delos thanks to Ruben Post c/o Paul Bardunias. 2019-01-17: Added an entry for the romance Moritz von Craon. 2019-04-10: Added a link to Usamah’s memoirs and to the free translation of Pietro Monte’s Collectanea.